My entry for Wallpaper Contest! Another TRC job. I know, you note that I really like this manga. Of course, CLAMP are my favorites mangakas. They draw very, very good, and this mangas has drama, action, suspense and love... The scan of this wall is amazing. Ambient is dark, and I love it. Overcoat by Syaoran-clone (He is so handsome X-P). I decided to start a CLAMP Project by their good tecnique and the difficult for working in the scans. I want to improve my vectoring. Hope that my job and studies do not bother. About the wallpaper... Mmm, it is hard. It has a lot of details. Sakura's dress was complicated. But I love it. The dress give a femenine touch to the wall. Syaoran-real and the clone are the opposite side, with their simples clothes. Curtain was to vectored of here, and the candles are here. Interior light was necessary to iluminated, and the curtain to give it a formal touch. Well, I like the result, and I believe you like it, too. the vector work is great! really clean and smooth. all those details were handled nicely. sakura's dess is really gorgeous. the bg is really great too. you sure had patience vectoring all this, but it was worth it. is beatiful! the vector and wal is a a prefect work is so precious! The hair is usually hard to vector in CLMAP, but you did a very good job. It's a well composed wallpaper, with beautiful details. Maybe an orange shadow on the wall behind the candles would add more realism. 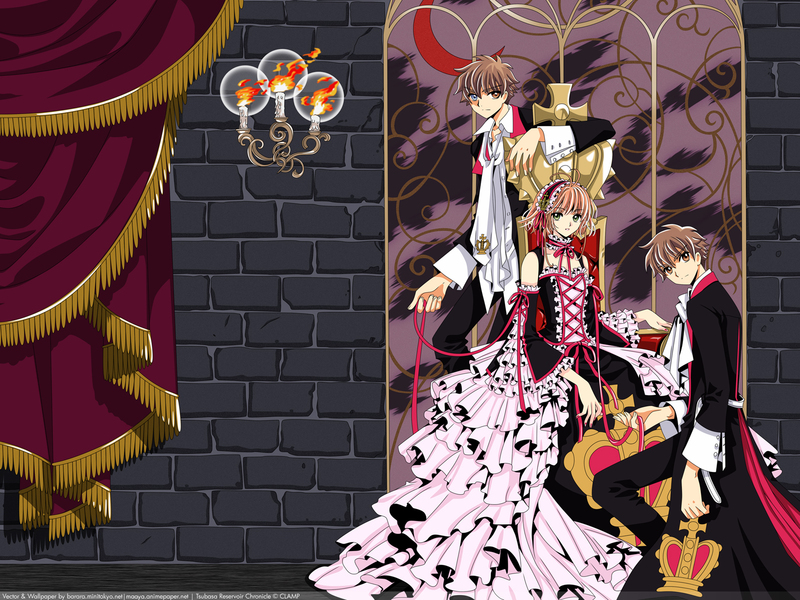 Wonderful~I think the backgroud is fit for the style of the clamp's draw. OMG! AMAZING! LOVE IT A LOT! WOW^^looks coooool, LOVE it^^thanks for the share!